I picked up some great habits from Julia Child along the way. When in public and something goes wrong, the ability to be self-deprecating and roll with the punches will endear you to your audience. Another habit I picked up from her when dining in other chefs’ restaurants, before leaving the restaurant, is to go into the kitchen and thank each and every cook. 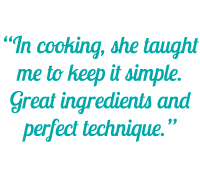 In cooking, she taught me to keep it simple. Great ingredients and perfect technique. And, of course, practice, practice, practice. 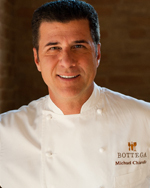 Michael Chiarello is an award-­‐winning chef and owner of critically acclaimed Bottega restaurant in the Napa Valley. He made his mark by combining his Southern Italian roots with the distinctive hallmarks of Napa Valley living. From his earliest childhood experiences – created around his mother’s California kitchen with his extended Italian family of butchers, cheesemakers and ranchers – Michael Chiarello dreamed of becoming a chef one day. Decades later, he has realized his dream, and much more.